Today was just about as perfect as a day could possibly get. 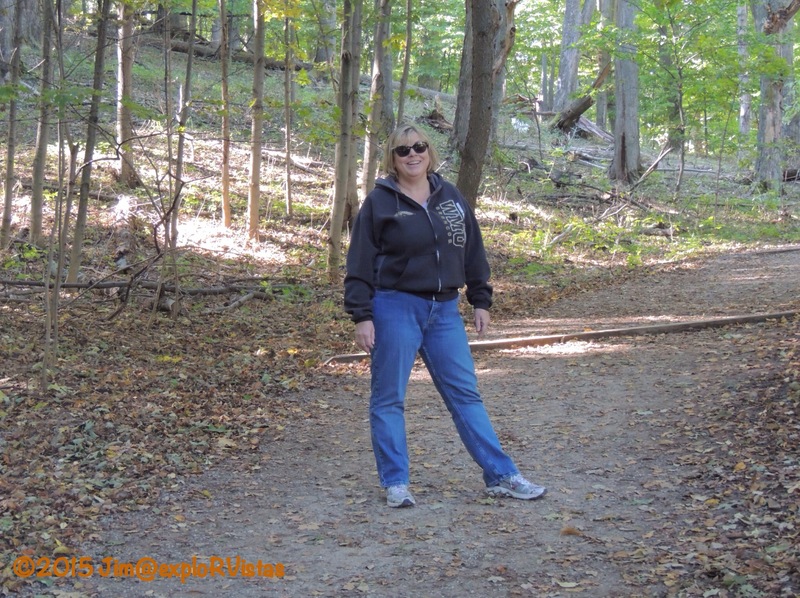 October in Michigan can be a mixed bag, weather wise, but today was begging us to come outside and play! 72 degrees, not a cloud in the sky, and a strong, warm breeze coming out of the south. So…play, we did! We loaded up our TerraTrikes and headed to Sleeping Bear Dunes National Lakeshore. 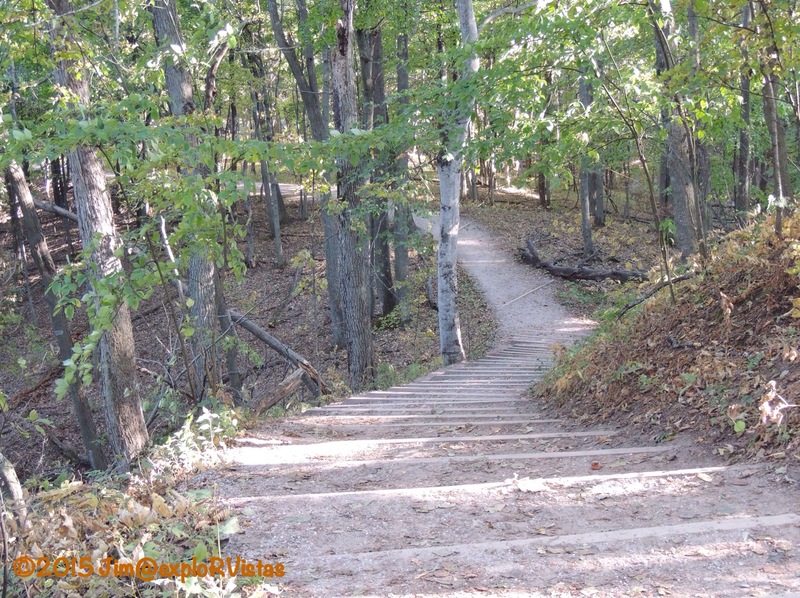 The portion of the Sleeping Bear Heritage Trail that we planned on triking was from the Dune Climb back east to D. H. Day Campground. 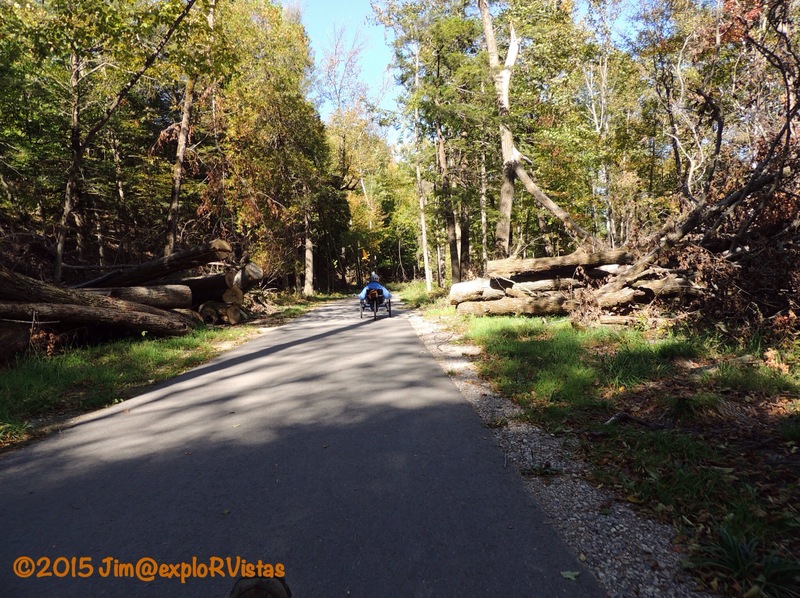 This is the portion of the trail that suffered the largest damage from the storm on August 2nd. It’s also one of the flattest portions of the trail. :). 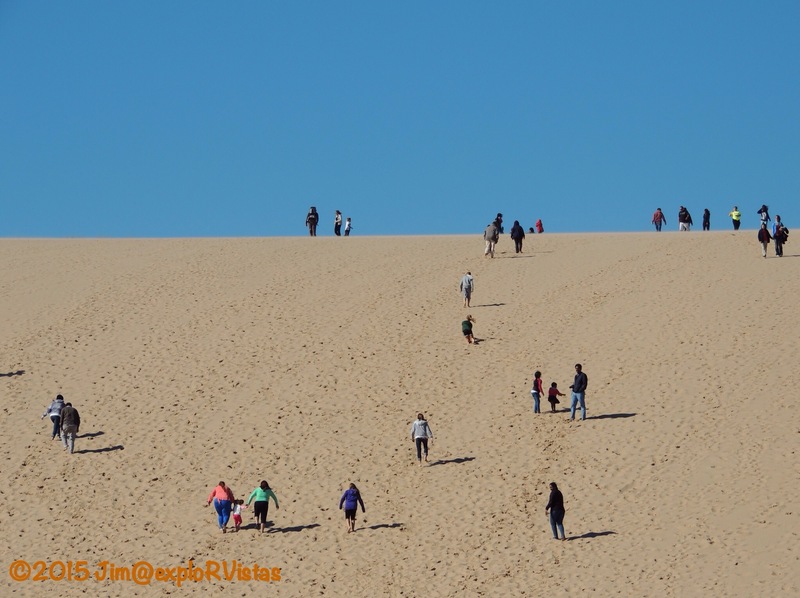 We pulled into the parking lot of the Dune Climb to see that we weren’t the only ones enjoying the beautiful weather! 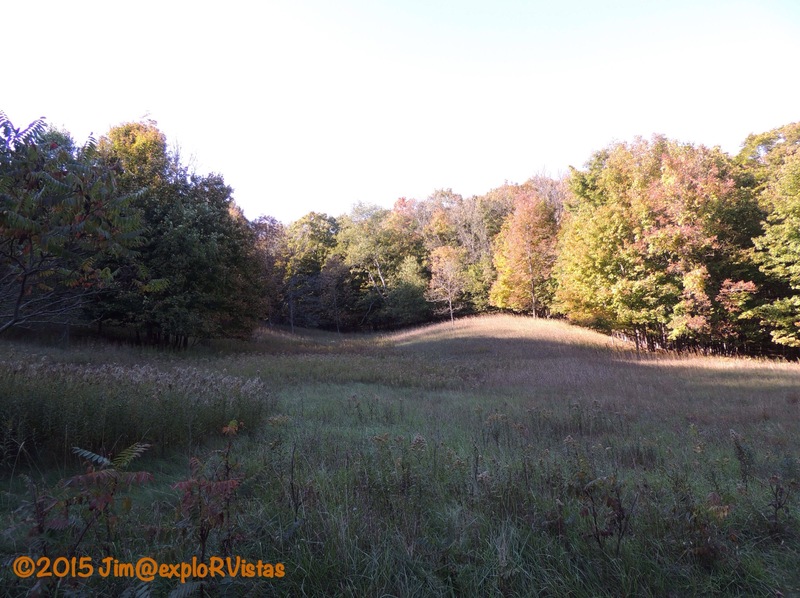 Out on the trail, the fall colors were evident in a few places. 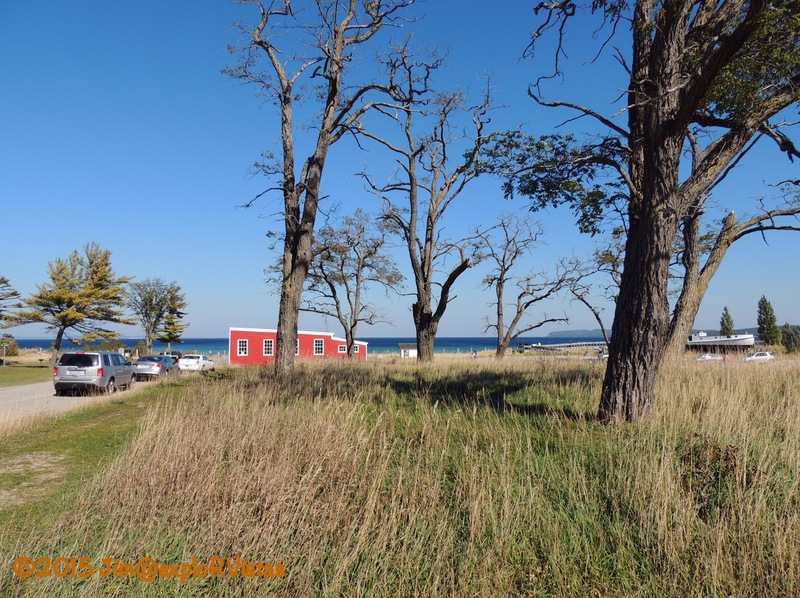 With Leelanau County being surrounded by the waters of Lake Michigan and Grand Traverse Bay, the weather is moderated by their warmer temperatures in the fall. So while the rest of lower Michigan is at peak color, we still have a lot of green leaves here. In fact, a lot of those green leaves are drying up and falling to the ground before changing color! The trail heads east through low dunes towards historic Glen Haven. There are several restored buildings in this former lumbering and fishing town. The red cannery building in the photo now houses a maritime museum. There also is a beach here. Farther to the east of Glen Haven is D. H. Day Campground. 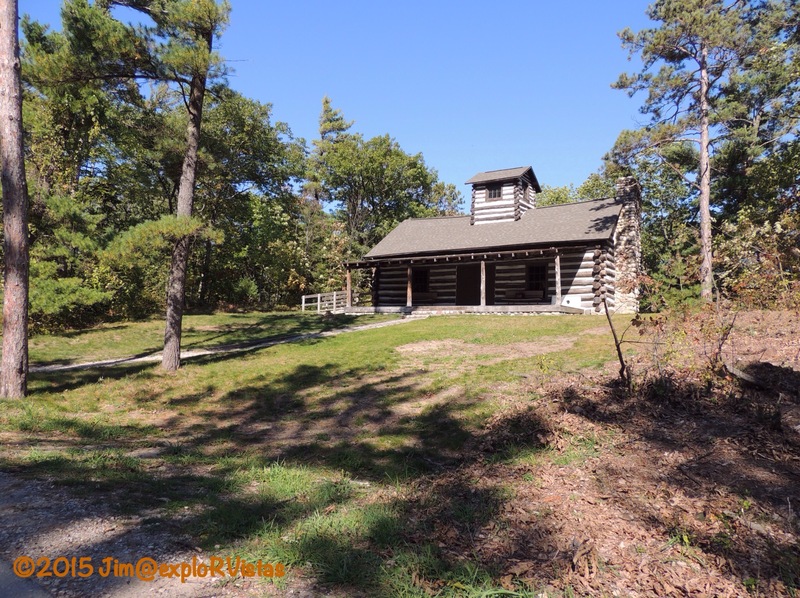 This is one of the old log buildings back from when this was a Michigan state park. This campground was closed for weeks following the August 2 storm, as there were hundreds of trees down. How no one was hurt, let alone killed, is beyond belief. The National Park Service did an amazing job of cleaning up the campground, as there isn’t much storm evidence left here. That’s not the case on other portions of the trail. Many of these fallen trees will be here for years to come. The portion of the trail we rode wasn’t too long, so we decided to go for a hike! 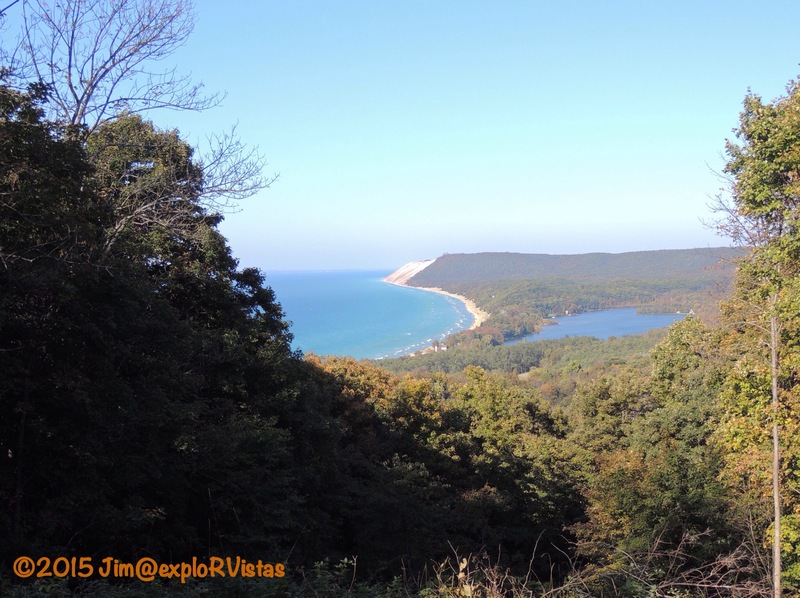 Last week, Howard and Linda from RV-Dreams hiked the Empire Bluffs Trail and wrote a blog post about it. 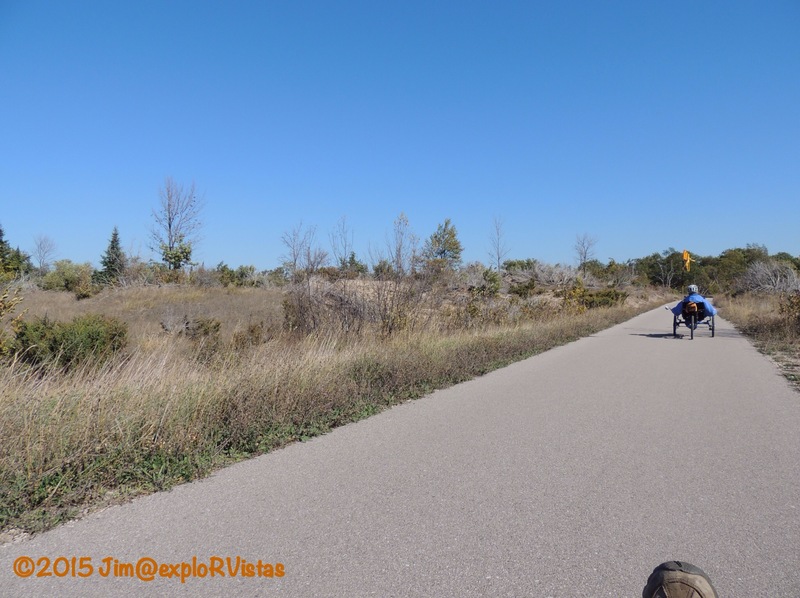 The trail is about 45 minutes from Wild Cherry Resort, and tucked away on the south end of the village of Empire. We’ve been coming to this area for years and never knew it existed. Proof that you learn something new every day! At 1.5 miles round trip, this was slightly longer than the Pyramid Point trail we have been doing. 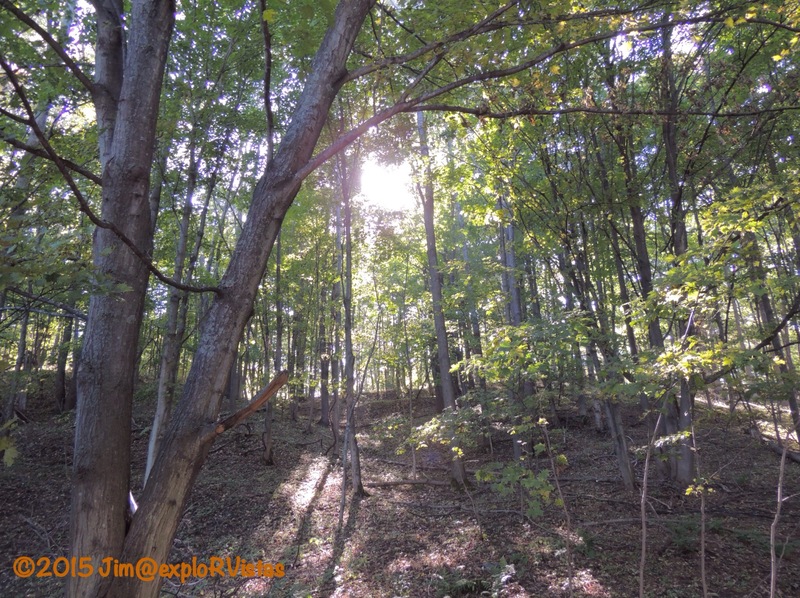 The sunlight was streaming through the trees, creating a surreal scene. 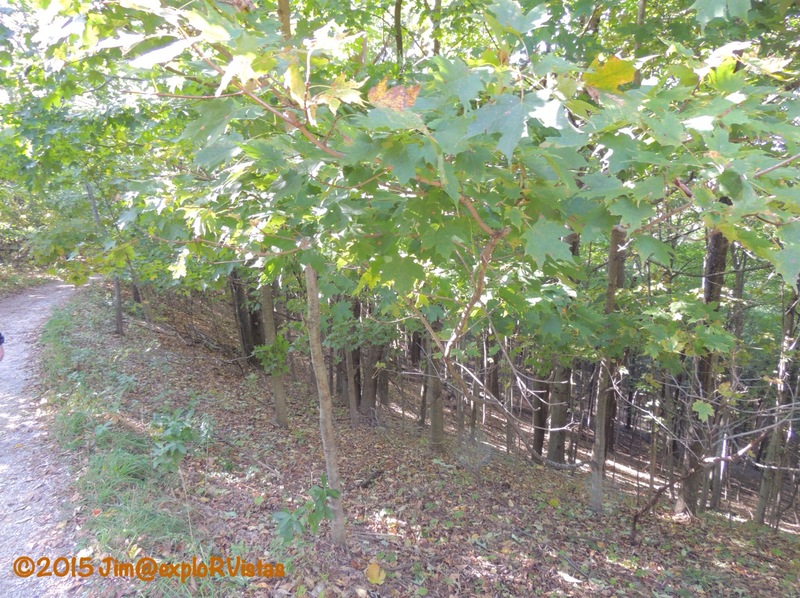 There were deep ravines and towering hills, typical of the back dunes that dot the shore of Lake Michigan in the state. A clearing appeared to our right, and we were greeted with this view. 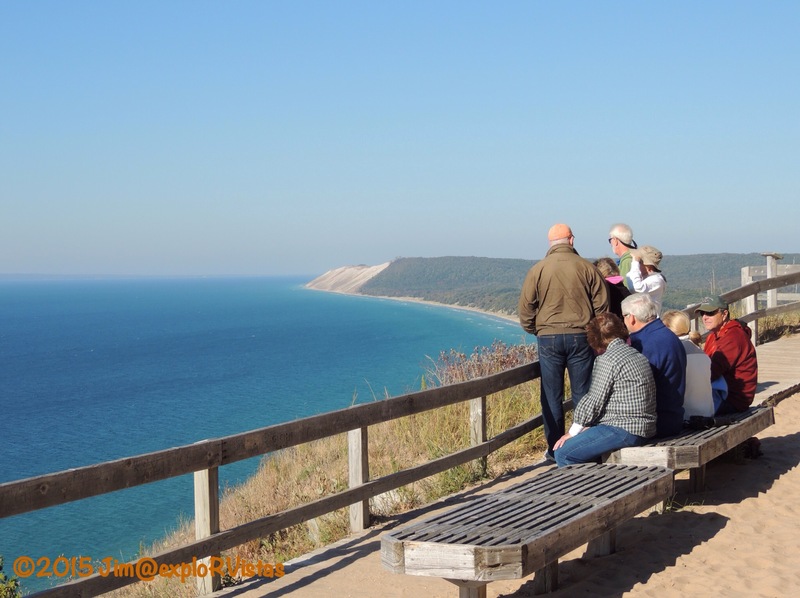 Here is Sleeping Bear Dunes in all its splendor. Lake Michigan to the left, North Bar Lake to the right. 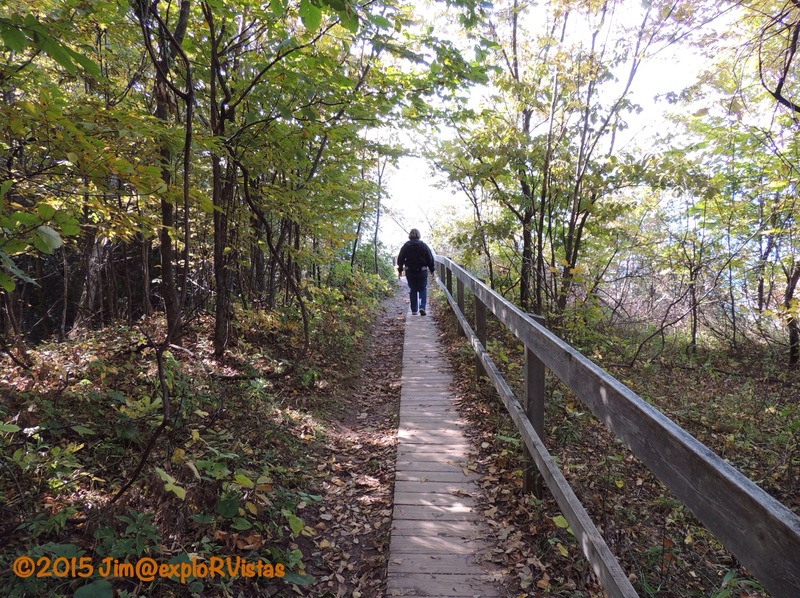 The trail continues on towards Lake Michigan, and becomes a boardwalk as it crosses onto the fragile dune above the shoreline. Once out on the dune, we were treated to this spectacular vista. The large waves that are breaking on the shore looked tiny from up here. 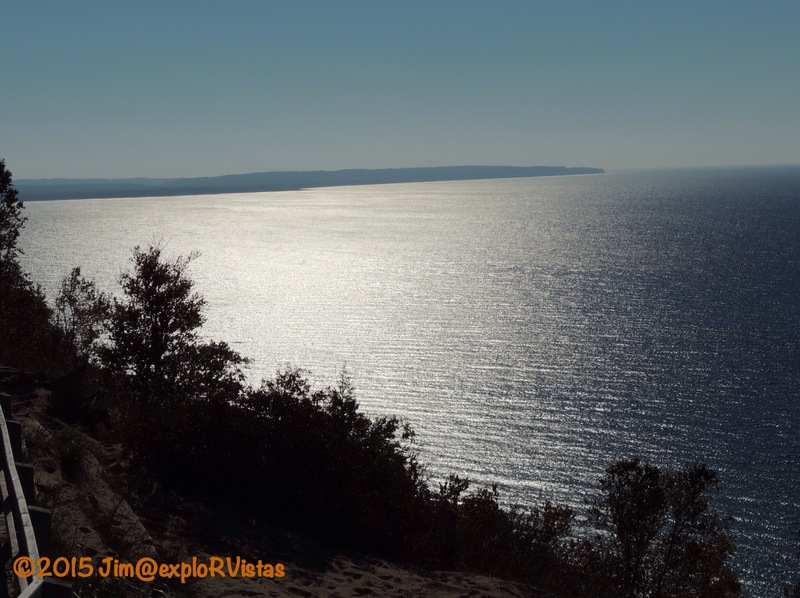 To the left, out over the lake, South Manitou Island can be seen in the distance. There was a steady stream of people coming out to enjoy the view. To the south, across the shimmering water, is Point Betsie. After soaking in the view for awhile, we headed back down the trail. Near the parking lot, I took a photo of these trees. We aren’t quite sure if they are going to end up being colorful this next week, but we are hoping they are. A lot of the maples closer to our campground are turning quickly, and they are beautiful…so here’s hoping for some pretty colors! On the way back home, we stopped at Cherry Republic in Glen Arbor and got Diana a piece of cherry pie. I opted for a cherry ginger ale. Yum on both counts! So today was about as good as we could ever hope a day could be. We are certainly glad we made the decision to come back north for October! Sounds like the perfect day to get out on your trikes. Now that you have two have you figured out how you are going to haul them? Sure did, Jim! I need to dust off my past welding skills and manufacture a bar that will bolt onto our current bike rack. The resort has a stick welder available for me to use. That is going to have to happen here in the next couple of weeks! I also need to sell the regular bikes. Yes, I would say it was pretty much perfect! This is such a fun area. We stay at Indigo Bluffs Resort. It was our first stay after the Fleetwood rally when we went fulltime. On our next trip up through Michigan last year, we made a last minute decision and turned left and headed over to Indigo Bluffs for a few days. 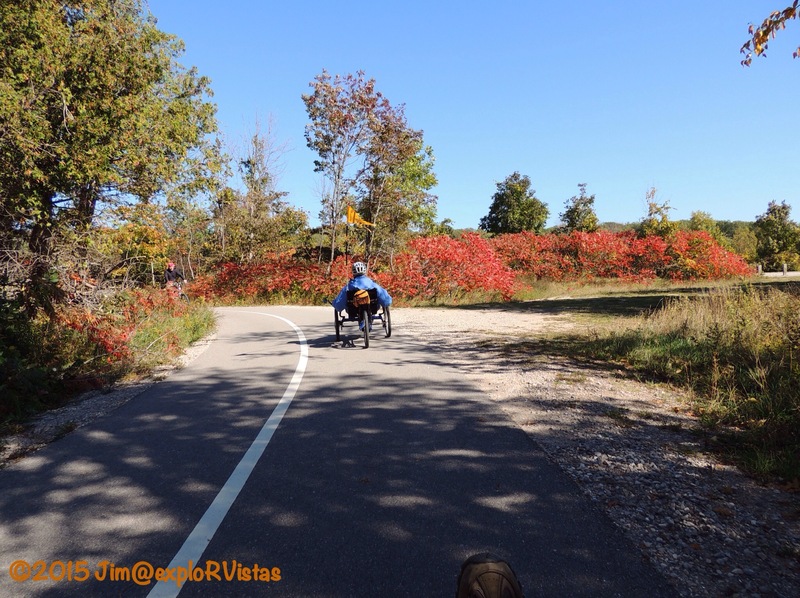 We got to ride the new bike trial in to Glen Haven and visit the Cherry Republic for lunch and cherry treats:) Love Lake Michigan!! It is so beautiful. Your new bikes look like fun! So you two know this area well! :). Indigo Bluffs is so convenient to that end of the park. Safe travels! Wow…that’s weird, as that same address worked on my last post. I just changed it to link to their main website, so all should be good now. If you go on their website, go to their Journal. That is their blog. Thanks, Peter! sometimes things just don’t work! I had been having problems with my ISP about things like that. I ended up deciding to let my peterpazucha.com expire and maybe some day I’ll repurchase it, but in the meantime I moved my other stuff over to peterpazucha.wordpress.com and for what I wanted that’s all I need at this stage in life. it’s not like I’m selling images now. more a case of keeping in contact with former models and customers. You will have to come over to Leelanau County sometime, Sue! ABC’s Good Morning America voted it as the most beautiful place in America in 2011. That September broke attendance records, as a result. Still, it rarely feels crowded up here. (It has settled back down). The photo of the people on the boardwalk is close to a launch point for hang gliding, although you don’t see hang gliders very much anymore. I’ve never seen people on boards, nor have I seen signs prohibiting them. Perhaps there would be too much friction sliding on sand? I just know it has become an attraction in some areas with dunes. Perhaps the sand needs to be very fine. What a great hike! I have to start a new list for all the places I learn about! Most of us know about the BIG places, but these smaller, less known places are just as amazing! Thanks, Tracy! I’d see that view on so many photos, and I always wondered where it was taken from. Howard and Linda sure found out! It looks like an absolutely spectacular autumn day! Perfect for pulling out those TerraTrikes again. You guys are sporty combining both biking and hiking! And what a view…ahhhh. Fall has almost passed up here – the trees have been stunningly beautiful in yellow and orange, but most of the leaves have gone. Getting closer to winter. But before that – they have promised a warm weekend so we are planning in taking advantage of it! Have a lovely weekend! The colors were peak today, but it was cloudy. Hopefully the trees are still good tomorrow, as it is supposed to be sunny! You have a great weekend also, Inger!